Ditch the red, white, and blue-striped popsicles this Fourth of July weekend, and flex your baking skills instead with this colorful pie. The sweet, lightly spiced flavor of the egg custard provides the perfect contrast against the bright tanginess of in-season berries. 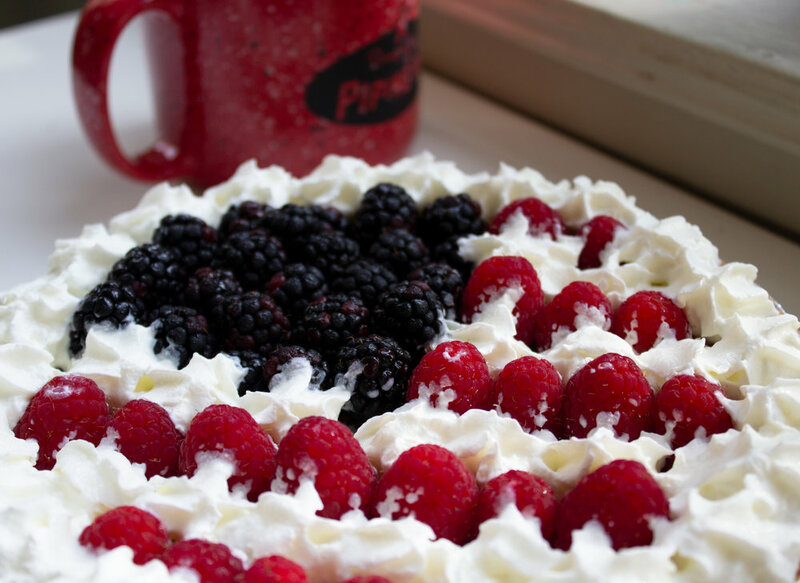 Finished off with generous amounts of whipped cream and a Pinterest-worthy flag design, this pie will be a welcome finish to any barbecue. 1. Bake the pie shell at 400 degrees F for 5 minutes. Set aside. 2. Combine the melted butter, sugar, flour, milk, vanilla, and cinnamon. Add the beaten eggs and mix well. Pour the filling into the partially baked pie shell. 3. Bake at 325 degrees F for 45 to 55 minutes, or until an inserted toothpick comes out clean. 4. Let the pie cool at room temperature for at least 30 minutes, then place it in the fridge for at least another hour. 5. Once the pie is completely cold, decorate with a US flag design. Arrange the blackberries in a quadrant for the stars, then alternate stripes of red raspberries and whipped cream all the way down. Edge the entire pie with a ring of whipped cream rosettes. A ready-made pie crust and canned whipped cream streamline the process and minimize baking-related stress. Feel free to make your own shortcrust pastry or fresh whipped cream, and the finished pie will taste all the better. Though blackberries and raspberries are used here, any combination of blue and red berries will work. Blueberries and strawberries, in particular, provide a sweeter, less tart flavor. The pie tastes even better after being allowed to sit in the fridge for a day (but if you do this, make sure to add whipped cream only when it’s ready to eat).